A platformer in which, in addition to jumping on the platforms, our task is to reflect balls of various properties. Depending on the mode selected, the tasks in HackyZack consist in reaching the exit or destroying all the diamonds on the board. 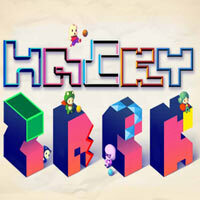 HackyZack is an original platform game that made its debut on personal computers and later on the Nintendo Switch console. While an independent Spaceboy Games studio was responsible for developing the PC version, Kittehface Software helped him to create a version for the Nintendo platform. In HackyZack, the action is shown from the side. As we play, we take on the role of the title boy who travels over a hundred levels located in six different worlds. In addition to the genre's characteristic platform jumping, the gameplay is based on bouncing balls with various properties such as greater elasticity or slower movement. The tasks vary depending on the mode chosen; while in Goal Mode we have to reach the exit with the ball, in Target Mode our goal is to destroy all the diamonds on the board as quickly as possible, as in the popular Arcanoid. As we progress, we collect stickers that give us access to challenges from the Target Mode module and unlock new protagonists. While on personal computers HackyZack allows you to play on your own, the Nintendo Switch version has a local multiplayer mode. Two-dimensional graphics of HackyZack were made in pixel art technique. The struggle is accompanied by a relaxing soundtrack composed by Vincent Rubinetti.